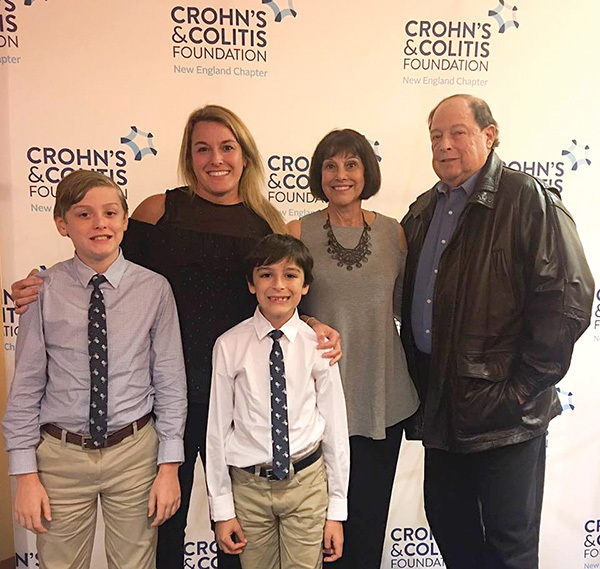 Mason, Jill and Andrew Wetmore, and Judi and Steve Simmons at the 2018 Crohn’s & Colitis Fundraising Awards Banquet. Mason Wetmore, a seventh grade student at Swampscott Middle School, will be participating in The Take Steps for Crohn’s & Colitis Fundraising Walk on June 8, 2019. Mason was chosen as the Crohn’s & Colitis Foundation’s Pediatric Honored Hero for 2017. This year, he will not only lead the local community but also the entire Boston community through sharing his story and leading by example with his fundraising. Mason, the son of Jill Simmons-Wetmore, brother of Andrew Wetmore and grandson of Judi and Steve Simmons was diagnosed in December 2016 with Crohn’s Disease, a debilitating, medically incurable disease that attacks the digestive system. On April 28, The Point of Pines Yacht Club in Revere will sponsor a fundraiser brunch from 10 a.m.-2 p.m., with raffles and a silent auction including gift baskets, restaurant and spa gift cards, jewelry, a home alarm system and many other great items to support Mason’s effort. All families are invited. For more information about the brunch, to donate to Mason’s campaign or to join Mason’s team in the walk, please contact Jill: JSIMM77@aol.com or 617-291-8184. To support Mason, visit crohnscolitisfoundation.org/goto/Masonsmarchers2019.